The old Kennecott mill town was abandoned in 1938 and relics were left behind largely intact. The National Park Service offers daily tours of the entire property. It was Labor Day weekend, and our family of three had been in the car since early morning, departing Anchorage for the mountainous glens of Wrangell-St. Elias National Park. Settled in 1900 as the Kennecott Copper Corporation to mine and transport copper ore to the town of Cordova between 1911 and 1938, Kennecott netted more than $100 million before closing in 1938, and now serves as a National Historic Landmark. McCarthy was the left hand to Kennecott’s right. Since life on the actual mine settlement was rather sedate, enterprising business owners hastily constructed the village of McCarthy as a center for relaxation and commerce. 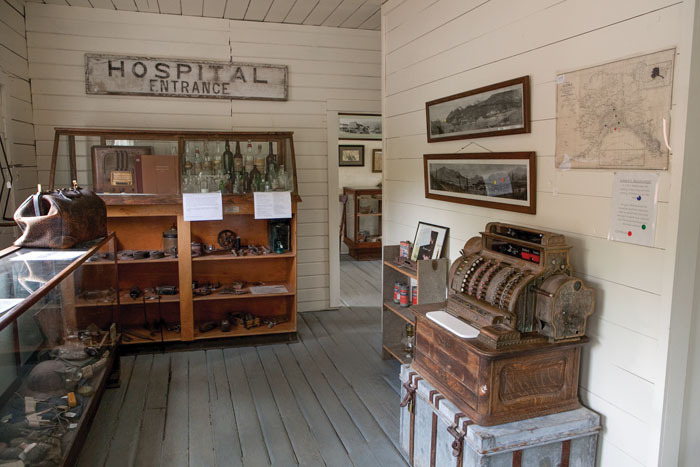 Located five miles downhill from Kennecott Mine, McCarthy was the gathering place, and remains so today, with funky storefronts and a resident base of only a few hundred. 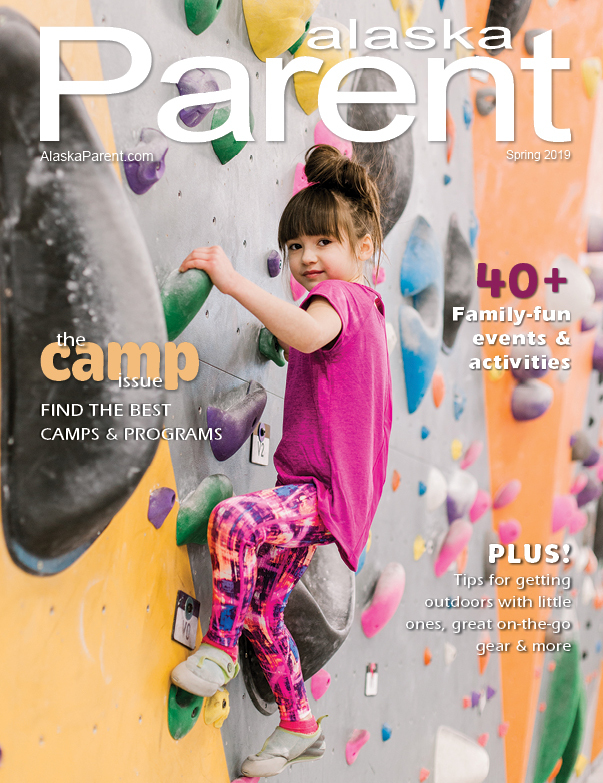 Taking children to McCarthy and Kennecott is a decision made with careful consideration. Reaching the communities means a day of hard driving along 60 remote miles of gravel roadway with no services or roadside assistance. Once there, everything must be carted over a small suspension bridge to a pick-up point, since no private vehicles are allowed. 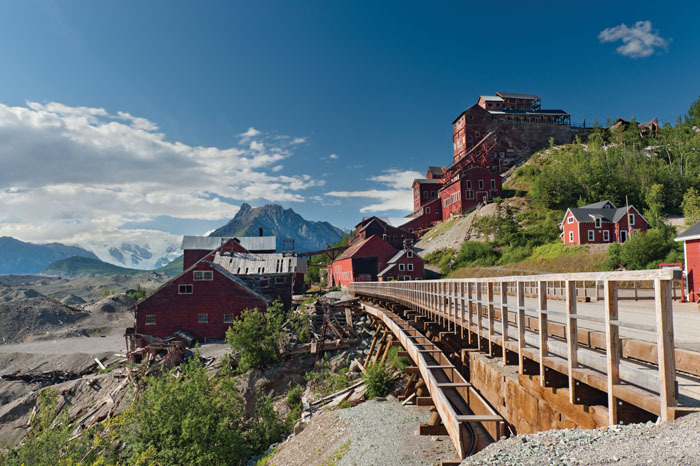 But for the independent traveling family, McCarthy and Kennecott offer an opportunity for history and recreation bundled together in this remote corner of Alaska’s wilderness. While a surprising number of accommodations are available for travelers, ranging from campgrounds to cabins, our family prefers to stay at Kennicott Glacier Lodge, a beautiful property overlooking the valleys, rivers and glacier for which it is named. Lodge manager Christina Kirkwood, a seasonal resident since childhood, says access is key for parents and kids. The major draw is the mine’s inner workings, including a school, general store and employee housing. The National Park Service has done an admirable job of keeping historical significance intact, and offers daily tours of the entire property. Youngsters will enjoy the Junior Ranger program and a chance to explore life in the settlement, where families spent every available moment living, working and playing together. The entire tour takes a few hours, and parents should heed several uneven walkways and potentially dangerous bridges for younger children. Hiking is easily accessible from Kennecott, with 2-mile-long Root Glacier trail serving as the main route to other trails at higher elevations. We also found the historic roadbed trail between McCarthy and Kennecott to be a great mountain bike route for our budding cyclist. The trail leads to the main road into town, where the McCarthy Museum awaits exploration by curious kids. 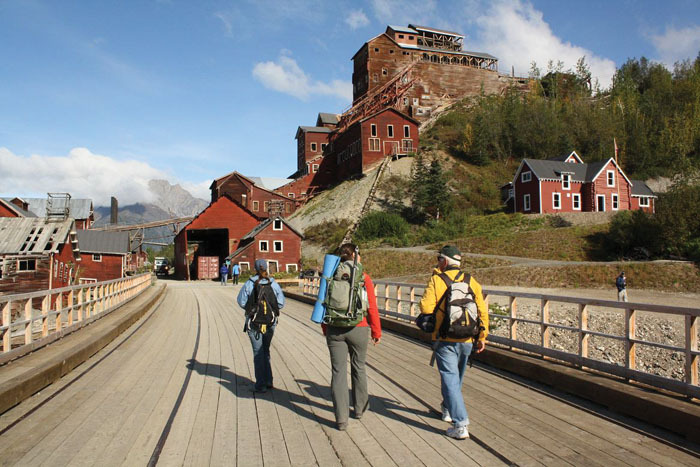 Both McCarthy and Kennecott are home to a number of guiding companies that offer day trips and overnight excursions into Wrangell-St. Elias National Park, beginning with glacier hikes on Root Glacier. Sporting crampons, kids and parents can safely navigate ice caves, glacial rivers and other unique features of the area under watchful supervision of trained guides. Our son summed up the weekend best as we reclined on Kennicott Glacier Lodge’s expansive deck our final evening. “I think this is the most Alaska-ish place in the world,” he said. Driving: McCarthy is 314 miles from Anchorage via the Richardson and Edgerton Highways. The last 60 miles of roadway is the narrow, state-maintained gravel McCarthy Road. While recently upgraded to remove old railroad spikes, ties and even rails from the road bed, it is still a tedious, pot-holed drive that can wreak havoc on a car traveling over 35 mph. Follow all posted signs and instructions, and be prepared with extra water, food and warm clothing, just in case. Kennicott Glacier Lodge has an excellent website that explains the details of driving to McCarthy-Kennecott. kennicottlodge.com/getting-here/by-road. Flying: Wrangell Mountain Air offers daily service from Chitina to McCarthy, a 25-minute flight. At $258 round trip, it’s not cheap, but is an excellent option to capture both the view and the experience. wrangellmountainair.com/getting-to-mccarthy-alaska. Visitor information: The Copper Valley Chamber of Commerce can provide information about transportation, accommodations, and activities between Glenallen and McCarthy/Kennecott. 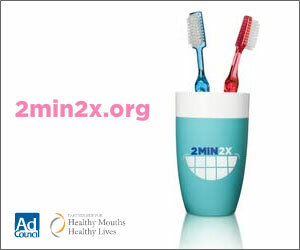 coppervalleychamber.com.